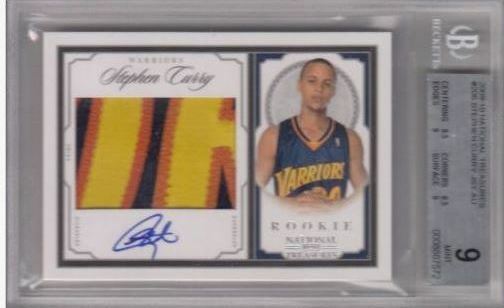 Most Expensive Stephen Curry Rookie Cards From 2009-10. I was surfing around eBay looking at what Stephen Curry 2009-10 rookie cards have sold for in the recent past. I wanted to see the highest prices that basketball card collectors paid for the Golden State Warriors’ superstar. I clicked on the “Completed Listings” button and this first card caught my eye. It is the Stephen Curry 2009-10 National Treasures Gold Rookie Autograph card numbered to only 25 made. It is also graded a BGS 9 with the autograph a grade of 10. So, what did this premium Curry rookie card end up selling for, you ask? It sold for a cool $15,000!! I took a screenshot of the completed eBay auction. You can see it below. 2009-10 Stephen Curry National Treasures RC Rookie Patch Auto BGS 9 10 Auto. After searching more, I noticed this other Curry rookie card that sold for a hefty price on eBay. 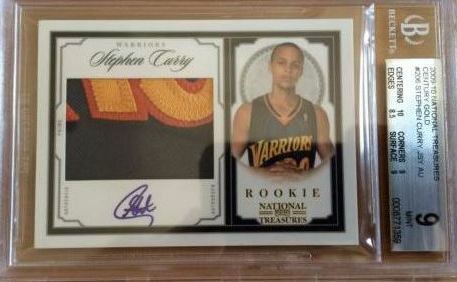 This one is the Stephen Curry 2009-10 National Treasures Autograph Rookie Patch. This card has a grade of BGS 9 and the autograph is a perfect 10. This sweet rookie card sold for a cool $5,955.00. See screenshot of the auction below. Stephen Curry 2009-10 Topps Chrome Refractor Rookie BGS 9.5 Card Numbered To 500. The next card that I noticed was this one. 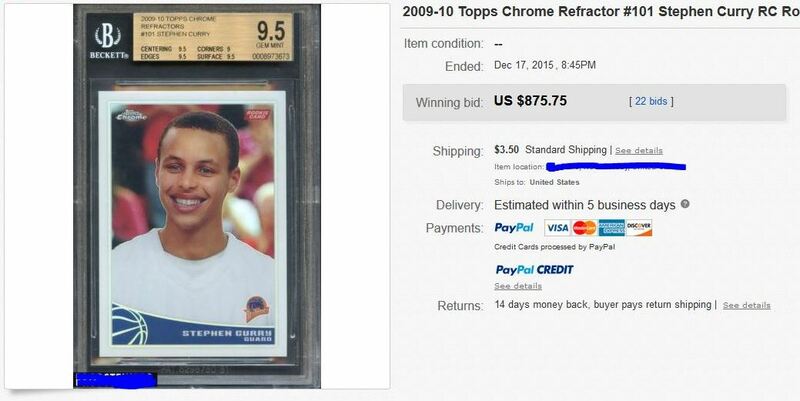 It is a 2009-10 Topps Chrome Refractor Stephen Curry rookie card numbered to 500. It is also graded a BGS 9.5. Topps Chrome is always a winner with collectors. However, this card is kind of dull in my opinion. The photo on the front features a baby faced Steph Curry. Too bad that Chrome could not have captured an action shot of Curry instead of basically a mugshot. Still a very nice card though. By the looks of what it sold for, collectors still love this card though. It sold for a solid $875.75. Stephen Curry 2009-10 Playoff Contenders Rookie Ticket On Card Autograph RC. I actually bought a hobby box of this product back in 2009. But my luck with busting packs has not been good. I did not get this sweet, awesome card in any of those packs. But there was a lucky collector who did. 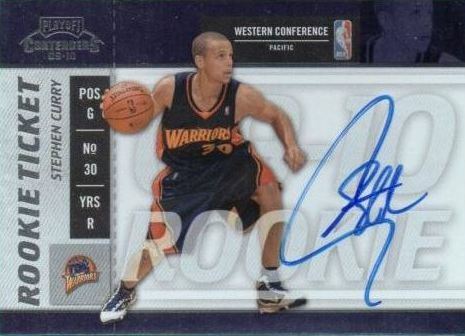 And it may have been this eBay seller who recently sold this Stephen Curry 2009-10 Playoff Contenders ROOKIE TICKET On Card Autograph rookie card for $429.99. I love the photo on this Curry rookie card as it shows the Warriors’ super player IN ACTION! Show Off Your Stephen Curry Basketball Cards Below. Do you have an awesome Stephen Curry rookie card or non-rookie card that you want to show off to other basketball collectors? If you do, you can submit it below. Please let us know the brand and year in the description box. You can also add your website URL if you have one. Finally, you can download a couple of photos of your Treasured Steph Curry card.